Here at ‘On the Scent’ we try our best to provide training which is fun, kind and motivating for both the dog and the handler. Our classes are held in the East Anglia village of Great Ashfield which is situated between Bury St. Edmunds and Stowmarket in Suffolk, we are drawing clients from Lincolnshire, Cambridgeshire, Norfolk, Essex and London and in 2012 we had a client travel from Germany over night to attend one of my Friday morning Classes, this was very humbling. The classes take place outdoors on our new ten acre site, where we are able to train in a more natural environment, with all the smells and some of the distractions that may be encountered in everyday life. We used to be in the village of Thurston, Suffolk on a smaller site, but as we expanded we felt we wanted to increase the type of training and services that could be provided. 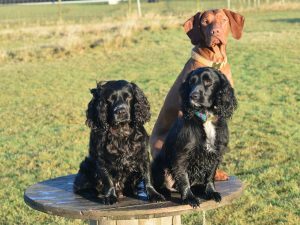 We provide training with a ‘behavioural influence’ as the two go hand in hand, along with the skills needed to have a well balanced and happy dog. We do not offer certificates of success as we believe all clients do achieve their personal best and for some clients being in a competitive environment can be off putting. For those wishing to compete in any of the disciplines we offer, I am able to suggest other dog schools in the area. 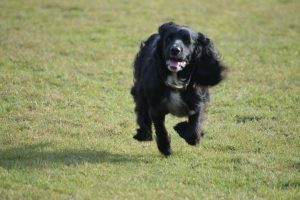 All types of dogs are welcome to attend our classes, however, our speciality is in the ‘hunt, point and retrieve’ breeds and the ‘working cockers’. Our aim is to teach the handler to train their dog. Swayne and Partners veterinary Surgery in Bury St. Edmunds hold ‘puppy socialisation’ classes for puppies who are not yet vaccinated and I was delighted when they asked ‘On the Scent’ to take one of the four sessions to discuss the importance of training dogs and their owners, as training and behaviour has moved on quite a bit in the last ten years. At the vet puppy socialisation class, handling skills, name recognition, the sit restraint and general obedience are discussed along with ‘controlled play’ with other dogs, inside and outside the home and the importance of timing, consistency and positive reinforcement. Here at On the Scent we have had the opportunity to also train DOGS WHICH ARE DEAF, both in Obedience and Dog Agility. For further information do not hesitate to get in touch with me. We thoroughly enjoy our work here, it is fun, interesting and challenging, which keeps us on our toes ! ‘On the Scent’ do not profess to have all of the answers and are happy to call upon others in our field of work for their help, support and advice, as this is another way in which we can grow and improve our skills for both our clients and their dogs. For those of you on social media, we now have our own public face book page, ‘On the Scent’ Dog training Suffolk. This face book page like this website is a work in progress, so do take a look at it for up to date tips and clips of some of our training classes. For behavioural issues like aggression towards people or other dogs, separation anxiety and more challenging behaviours then Helen Goodall of Dogs Behaving Badly is the best behaviourist to contact. Details maybe found on the ‘About Us’ page of this website. May I just add by saying a huge THANK YOU to Paul, Helen and Adrian for all their ongoing help and support. We all work well together as a team. I do appreciate all their help. With them on board ‘On the Scent’ has been able to grow. About our pets… we currently share our home with various animals, three dogs, ten cats and three horses along with a few hens. Thank you and God bless you all. Sophia. As a child I was brought up with dogs, cats and horses and always felt I had an affinity with them. My father and mother always encouraged my enthusiasm for animals and as I grew up I started to concentrate more on the dogs and the training that could be achieved through food reward and praise like teaching simple tricks and tasks around the home rather than the horses. Back then dog training was mainly check chains and formality in the classes I attended and play was not incorporated in the class situation. We didn’t know any different then. Thank goodness training has progressed since then and I am delighted that the majority of clubs today now use play as well as food reward and praise to achieve results from the dogs being trained, whether for obedience competitions, gun dog trials or agility. Some of my customers were transgender and would travel from other towns to see me as they knew I was open minded and discrete. Some of these customers were lawyers, barristers, public figures who needed to come and be helped. The most rewarding part of my work though had to be the ladies who would come to be via the Hospitals who had undergone surgery for a mastectomy. I was able to help them feel like a shapely lady again and play a very small part in their re cooperation process. These ladies had wonderful sense of humours and were a delight to meet and help. Of course there were also the comedians at Christmas, the young men who were wanting to buy for their girlfriends who would pop in slightly merry as they felt they needed Dutch courage to come into the lingerie department of the store. However, my heart was always with animals, especially dogs and slowly as time went on I started to help friends to train their own dogs as well as my own, eventually helping me to make the decision to start training other people and their dogs on a one to one and finally starting up the classes. As of 21st Ocober 2009 I have been accepted as ‘Guild Master Dog Trainer’. For further information please go to www.godt.org.uk . Since starting up ‘On The Scent’ I have met some wonderful people. 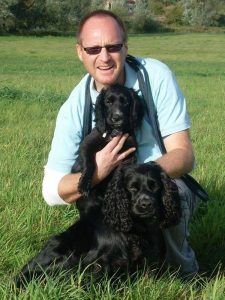 After appearing in the November 2009 issue off the Suffolk Magazine, I was invited as of January 2010 to write a monthly column for them on Dog Training and Behaviour. I felt extremely lucky and blessed to be given this opportunity to continue to promote responsible dog ownership to the general public. I gave up this opportunity in 2016 due to life simply getting in the way. I feel I would like to mention that for me personally if it wasn’t for my Christian faith my path may have been very different. Thank you for visiting the ‘On the Scent’ website. We hope you enjoyed its content and will want to tell your friends about us. 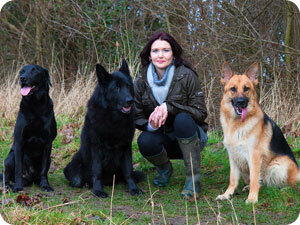 My name is Helen Goodall and I have been a practising Dog Behaviourist since 2000, mainly in the Suffolk area. I am certificated with the Canine Behaviour Centre. 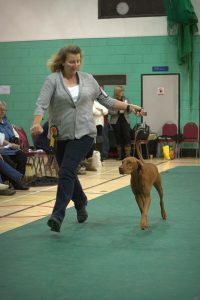 Working with organisations such as RSPCA and Action Aid for Animals, she has successfully rehabilitated and re-homed many dogs needing critical help. I am a Veterinary Nurse and resident Dog Behaviourist for Haughley and Thurston Veterinary Surgeries. I have known Sophia for many years and encourage owners to join Sophia’s agility training as a vital part of a dog’s learning and positive experience process. Agility is a great way to improve a dog’s physical confidence and ability. Sophia’s outdoor facilities create a calm open environment in which your dog can learn and have fun around other dogs, safely. Part of my service is to visit you in your home and work with you, developing a therapy and training programme that is specific to the needs of you and your dog. During an initial consultation and progressing through hourly follow-up sessions, working with you and your dog on any behavioural problem. I specialises in dog aggression, socialisation, fears and phobias, separation anxiety, body language and the effects of stress. All behaviour modification therapy programmes devised by me, are based on positive association principles and the influence of positive guidance and leadership. To learn more about me and my work, visit my website www.dogsbehavingbadly.co.uk For consultations and more information, call me on 01359 241890 or 07788 718852. Paul is a qualified Agility Approved Instructor(AAI) and teaches on a Sunday afternoon at 2pm and at other times when he is able to. He has competed at a low level with Spider, his working Cocker Spaniel but now happily teaches our clients to have fun with their own dogs. Paul is branch manager of a business in Ipswich where he is also their qualified paint technician.